The common technical interview question in java is to count the occurrence of a specific word in the string but what if interviewer ask to count the total number of times each alphabet appears in the string . That the question, whose logic you need to think at that point of time and sadly there is no built in java method to give you the direct answer by passing the input string . So in order to be prepared for such type of questions I have shared the program code below . 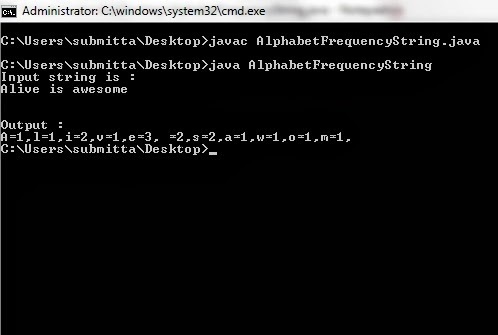 Input string : "Alive is awesome"
Note : The result is case sensitive , it means uppercase and lowercase alphabet are treated as different. I will use HashMap to count occurrences of Character in String in java. It will have Character as key and its count occurrences as value. First we will convert the given string into char array.Then , we will traverse char array and increment its value by 1 for each Character present in the input string. * We start traversing the string in array z[i]. Please mention in the comments if you have your own code on count occurrences of character in String in java.